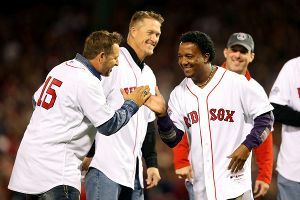 BOSTON -- While comparisons can be made between the 2013 Red Sox and the 2004 team that won it all against the St. Louis Cardinals to bring Boston its first World Series title in 86 years, this year's bearded band of brothers is different from the '04 group of self-proclaimed "idiots. Over the next month, we're going to present 30 deals in 30 days: the best trade deadline deal ever made for each team. We'll start with a trade that eventually helped end a curse. Derek Lowe may have reached the end of the line after 17 seasons in the major leagues.The 40-year-old Lowe was released by the Rangers last month after going 1-0 with a 9. Indians broadcaster Tom Hamilton isn't backing down from his criticism of Reds reliever Aroldis Chapman for a high-and-tight pitch to Cleveland's Nick Swisher and his on-air suggestion that there should be retaliation during the intrastate series. The Texas Rangers have placed right-hander Derek Lowe on unconditional release waivers and signed utility man Mark Teahen (TEA-en) to a minor league contract. The Texas Rangers have designated veteran pitcher Derek Lowe for assignment to make room for Josh Lindblom, who will start Monday's game against the Oakland Athletics. ARLINGTON, Texas -- Rangers manager Ron Washington said 20-year-old Jurickson Profar and utility man Leury Garcia will split time at second base while subbing for the injured Ian Kinsler. ARLINGTON, Texas -- David Murphy will have to wait a few more days to get his bat going.Murphy, expected to be in the lineup against John Lackey (a right-hander he has dominated), was not available to start Saturday's game against the Boston Red Sox because of a stomach virus. ARLINGTON, Texas -- So that's the reason 39-year-old pitcher Derek Lowe made the Rangers out of spring training.For night's like Saturday, when the Rangers needed a long man out of the bullpen because their rookie starter got drilled by a line drive in the wrist. ARLINGTON, Texas -- The Rangers survived an injury to starting pitcher Nick Tepesch, getting home runs from A.J. Pierzynski and David Murphy and four hitless innings from reliever Derek Lowe for a 5-0 victory over Seattle on Saturday night at Rangers Ballpark.